Expectations where probate is not necessary in. The estate holds only personal property worth $150,000 or less. In this case, there will be a 40-day waiting period. After the waiting period has come, providing a death certificate and affidavit to the property holder will allow you to receive it without probate. The estate holds real estate and personal property totaling $150,000 or less. Similarly, you will have a 40-day waiting period. Here, a probate referee takes an official inventory and appraisal of the property, which will be filed along with a petition or affidavit at the probate court. The estate holds only real estate worth $50,000 or less. After a six-month waiting period, you will file a petition or affidavit along with an inventory and appraisal with probate court. The estate’s sole beneficiary is a surviving spouse. There is no waiting period; however, if a spouse is the only beneficiary to the estate. Pleadings will need to be filed with the probate court even though a full probate is not required. This is known as a simplified probate. A surviving spouse is not suppose to file an inventory or have the property appraised. He or she must want to consider doing anyway for the tax purposes. 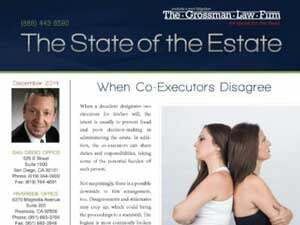 Are you looking for legal counsel in probate or trust administration for a California estate? 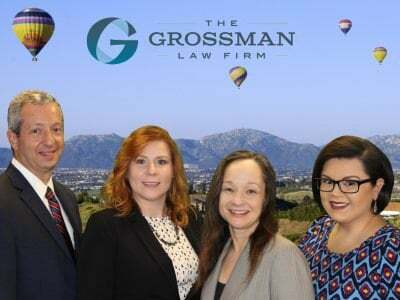 The California trust lawyers at The Grossman Law Firm offer San Diego estate planning, probate, trust administration, will contests, and trust litigation. For a no-cost consultation, call toll-free at 888-443-6590, or use our quick online contact form. 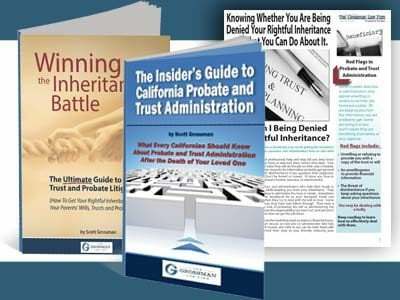 Also, be sure to order Scott Grossman’s essential FREE book and DVD, Probate a Will or Administer a Trust after the Death of a Loved One.